What Would Life Be Like on the TRAPPIST-1 Planets? An artist's rendition of the surface of a planet in the TRAPPIST-1 system. The system contains seven Earth-sized planets that could — with the right atmosphere — support liquid water on their surfaces. The TRAPPIST-1 system is home to seven planets that are about the size of Earth and potentially just the right temperature to support life. So how would life on these alien worlds be different than life on Earth? Here are some of the major differences. "If you were on the surface of one of these planets you would have a wonderful view of the other planets," Michaël Gillon, an astronomer at the University of Liège in Belgium and an author on the new paper, said in describing the discovery. "You wouldn't see them like we see Venus or Mars, like dots of light. You would see them really as we see the moon. … You would see the structures on these worlds." This chart shows the size of the TRAPPIST-1 star and planets compared to Jupiter and some of its large moons. All seven of the known planets in the TRAPPIST-1 system orbit closer to their star than Mercury orbits the sun. The innermost planet and the outermost planet are almost 30 times closer together than Earth and Venus at their largest separation. The reason these seven planetary siblings can fit into such tight orbits is because their parent star is an ultracool dwarf star. It's about 2,000 times dimmer than the sun, and only slightly larger than the planet Jupiter. Three of the known planets orbit the star in what's known as the "habitable zone," or the region around a star where the planet could have a surface temperature right for liquid water. The position of the habitable zone is different around each star — on a very dim star like TRAPPIST-1, which radiates significantly less heat than the sun, the habitable zone lies much closer to the star. But there's no guarantee that a planet in the habitable zone of TRAPPIST-1 can host liquid water on its surface. Without an atmosphere, water won't remain a liquid in space. For example, on comets (which don't have atmospheres), water ice sublimates directly into a vapor when it is heated by the sun. Even though the seven known planets in the TRAPPIST-1 system orbit extremely close to their parent star, the natural lighting on these planets would seem very dim to a human visitor. 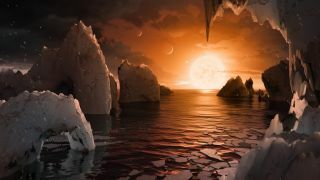 Ultracool dwarf stars produce significantly less radiation than sun-like stars, and most of TRAPPIST-1's light is radiated in the infrared wavelengths rather than visible wavelengths, according to Amaury Triaud of the Institute of Astronomy at the University of Cambridge in England, a co-author on the paper describing the discovery. TRAPPIST-1 would be able to warm the air on the surface of the seven planets, but the daytime skies would never get brighter than Earth's skies just after sunset, suffusing the world in a salmon-colored light, Triaud told reporters on Tuesday (Feb. 21). This artist's rendition imagines what the seven planets of the TRAPPIST-1 system might look like. The TRAPPIST-1 planets take almost no time at all to make one complete orbit around their parent star. Six of the planets make a complete an orbit in anywhere from 1.5 to 12.4 days. (The most distant planet's orbital period is thought to be about 20 days). That means one "year" (or what scientists call the orbital period) on most of these planets is less than two weeks on Earth. But the orbital period of these planets is slightly upset by their neighbors. "[The planets] tug and pull each other as they go orbiting around their star," Sean Carey, manager of NASA's Spitzer Science Center at Caltech in Pasadena, California, said during a NASA news conference on Wednesday (Feb. 22). Using the Spitzer Space Telescope, scientists were able to see the seven planets each time they passed in front of the dwarf star, or what's known as a transit. "What that does is it changes the timing of the transits a little bit, as the planets are tugging each other, so they (the transits) aren't happening as regularly as you would expect without the tug," Carey said. A travel poster for the TRAPPIST-1 system. Planets in the system would undoubtedly offer great night sky views. Even though the years are short in the TRAPPIST-1 system, the days would be very long — almost eternal, because the according to the scientists behind the discovery, it's very likely the seven planets are tidally locked, meaning that one side of each planet is always facing the star. The moon is tidally locked to Earth, which is we see only one side of our lunar companion (at least from the ground). There's some debate about whether or not a tidally locked planet could host life. Some tidally locked planets might be uninhabitable because the side facing the star would become extremely hot, while the other side would grow extremely cold. But some models show that if the planet's atmosphere can dissipate heat across the planet's surface, then life could still find a welcoming home there. To learn more about the differences between the individual planets in the TRAPPIST-1 system, check out this Space.com gallery.